Consumers wouldn’t ordinarily refer to their bed linens as “smart.” These are items they throw in the wash every week, wrinkle up during a rough night’s sleep, and don’t even see after the bed is made every morning. Just how can a mattress cover be intelligent? Find out by exploring the Luna Smart Mattress Cover. 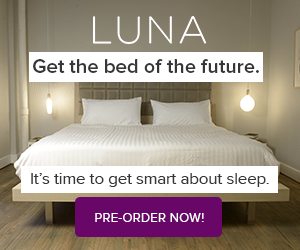 Click Here to Learn More and Pre-Order YOUR Luna Smart Mattress Cover! Luna wants to get to know you, literally. Every night sleepers generally do the same things. They turn this way and that or they lie down and go right to sleep. They scrunch up their bodies or restless legs kick around. If someone has trouble sleeping, there will be many periods when he gets up then goes back to bed, only to rise once more an hour later. This can go on throughout the night, ruining both night and day. Some people are unconscious of problems during the night. While they seem to sleep, in the morning they are still tired. This is a sign they did not sleep heavily enough. Luna records the movements and habits of its owner over a period of evenings and learns all about his sleep patterns. With this information sent by Luna, a person is able to make some judgment calls about whether he is getting enough sleep and, if not, why not? For someone who knows sleep is a problem, adjustments to the mattress cover’s temperature all night contribute to a better, fuller night’s rest. Luna goes further, however, by becoming a personal trainer of sorts. Let Luna know what your daily habits are: eating and exercise routines, for instance. Between sleep data and this information, Luna can offer suggestions about what you could do to get more rest at night. Luna was invented by someone with sleep problems; a person who knows how much planning and thinking goes into trying to get a good night’s sleep. These plans start when a person wakes up but end with anxiety that tonight will be another one of those nights. Let Luna help you realize when you are making some of the right choices and point out some flaws in those plans which could be thwarting your efforts to sleep. Eventually, it is the plan of Luna’s creators to go further and connect her to every part of one’s sleeping and waking routine through his smart phone. All routines like locking the door, setting the alarm, or setting the coffee maker for the morning will be looked after by the Luna Smart Mattress Cover. The bed will time the alarm for a period when the owner is sleeping lightly and can wake up fully without feeling groggy. There are many exciting plans for Luna down the road, but her inventors need some assistance to make their exciting and innovative product commercially viable. If those features do not impress you, think about how much better your sleep could be after years of sleeplessness.